The Mulloon Institute (TMI) welcomed key ministers to its campus near Bungendore in New South Wales last week in the lead up to the inaugural Drought Summit in Canberra. According to the Institute, the future of agricultural productivity in Australia will rest on farms being resilient to drought and being able to survive increasingly extreme ranges of climate. Prime Minister Scott Morrison, Deputy Prime Minister Michael McCormack, Minister for Agriculture and Water Resources David Littleproud and Senator Jim Molan were able to see first-hand how landscape repair and rehydration work is already boosting drought resilience and agricultural output on the Institute’s farms. Gary Nairn AO (right) welcomes Prime Minister Scott Morrison to Mulloon Creek Natural Farms. “We want to say to farmers and governments that we have a solution – we have a way to rehydrate and regenerate the Australian landscape and make our landscapes more resilient to extreme climatic conditions,” said the Institute’s Chairman Gary Nairn AO. While regenerative agriculture is a term becoming more common as stories continue to surface of farmers who embrace it doing well in these trying times, it is something that TMI has been practicing and researching for over ten years. The Mulloon Institute’s flagship project in southern New South Wales is a unique catchment-scale model for holistic landscape repair that can be adapted by communities across Australia to heal and rehabilitate the land and turn it into stable, resilient and productive landscapes. An initial trial project in 2006 incorporating the Natural Sequence Farming (NSF) work of Peter Andrews OAM was established at Tony Coote’s Mulloon Creek Natural Farms property east of Canberra with great success. Peter Andrews OAM and Tony Coote AM in earlier times. Over ten years that project resulted in a 60% boost to productivity on adjoining agricultural land while the creek was transformed into a healthy, vibrant ecosystem capturing flood sediments, recycling nutrients and providing valuable habitat. The wider catchment also saw improvements in water quality, water yield, and enhanced biodiversity from tackling soil erosion, habitat fragmentation and weed proliferation. This has now been expanded to the Mulloon Community Landscape Rehydration Project (MCLRP) which encompasses the entire water catchment, spanning 23,000 hectares and 50 kilometres of creeks and tributaries, and involving more than 20 landholders. It is anticipated to have an equally significant impact on local agricultural productivity, waterway and landscape health, albeit on a far more extensive scale. “The regeneration that is going on here, this needs to be replicated right around our nation. A nation that looks after its soil, looks after itself. And it’s the important work which you’re doing here that is a model for everyone,” said Deputy Prime Minister Michael McCormack. Deputy Prime Minister Michael McCormack address the media at Mulloon Creek Natural Farms in the lead up to the Drought Summit. Scientific benchmarking and monitoring forms an important part of the project and provides an evidence based approach to landscape restoration. Involving landholders in the monitoring gives them a deeper insight into the natural processes occurring on their properties and in the catchment. “It’s a great inspiration to be here and to learn of Tony Coote’s great philanthropy and passion for country, passion for the environment, and for the future of rural and regional Australia,” said Prime Minister Scott Morrison. The Institute’s ground-breaking work has been recognised internationally by the United Nations Sustainable Development Solutions Network and in Australia by NSW Landcare and the Banksia Foundation. It has also captured the nation’s imagination in a recent Australian Story episode on ABC TV that was the highest rating episode for the program so far this year. “The drought isn’t over by a long shot and the best use of tax payers’ money is for it to be invested in repairing and rehydrating our landscapes and assisting our farmers to transition to more regenerative farming practices,” Mr Nairn said. “This is what Government should be investing in so that when the next drought comes around farmers won’t need subsidies anymore. If they implement the techniques we promote they will cope better with extreme dry conditions have drought-proofed their farms and actually come out ahead,” he concluded. 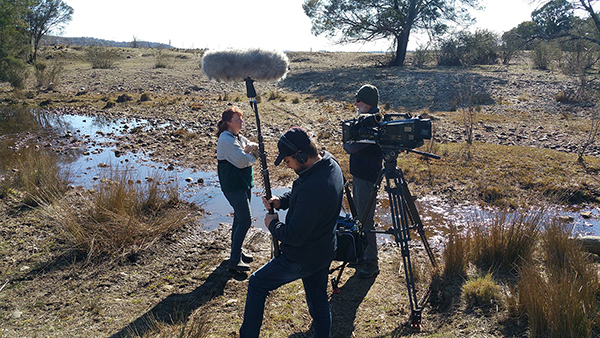 Australian Story filming at Mulloon Creek.